Not bad for 5 bytes of code. 2) Eliminate the ones that clearly don't compute the same value as the function needed. The first step is relatively easy, but you have to eliminate wild jumps or memory references to arbitrary addresses. From my reading, he just eliminated all jumps and memory references and only worked on values in registers. The second step was accomplished by sending test vectors of values to the known correct function (e.g. signum function above) and comparing the results with the generated function. Since most generated functions will be wrong, the chances of generated function getting the correct answer for all the test vector is very small. Still, the author examined that generated function if it passed all the test vectors. The test vectors could be hand generated (if you know a lot about the function), or generated randomly. Obviously, if the user generates them it takes more time initially, but that may speed up the process later. I suspect for many functions, generating random numbers is good enough. There have been many follow-up papers to this. While it was easy to minimize the code size, with a proper CPU model of timings, the program could also compute minimum time routines. And since the number of different routines grows exponentially with the number of instructions, you will need a lot of computing time to generate and test routines greater than 10-15 bytes long without some significant changes to the generator. 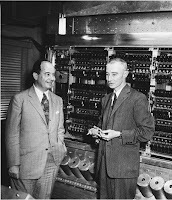 Massalin mentioned a not so obvious usage: giving feedback to the assembly language programmer. He mentioned that he used it to write a 500 byte printf routine. New assembly language is not written much anymore, but it still comes up. For example, Excel's recalc engine is written in 32 bit x86 assembler and if its performance wasn't good enough, this type of optimization could come in handy. There is a parallel between this idea and the idea of testing two or more implementations of the same function. In testing, you may have a known good model for what the code is supposed to do and the implementation under test. In this case, you take your test vector, run it through both your model and the implementation being tested and compare the results. If you are lucky, by definition the results should be the same. The model may be correct but quite slow, but this is fine for testing. This is one of the ways to test graphics drivers. The model for every operation may be easy enough to write but way too slow for real systems while the driver is optimized for speed both because of the code and the graphics chip. But having one model of what is right allows you to test many different graphics drivers and chips. One of the most enduring abstractions in computer science is that memory is located by address, holds values for a long time, but typically not forever and is uniform in the cost of access. Various kinds of storage like disks or tape are meant for the longest term storage and, to a first order approximation, forever. Glossed over in this abstraction are a few obvious things like different performance characteristics and size limitations. It takes a while to learn that this model of memory is not exactly right. To get a program working, you need to know lots of other things and this simple model works well. If you are lucky, you won't have to deal with the differences between reality and the model. The concept that memory is of infinite size is the first to go. Your first programs never need much space, but then you start down the road of saving computations, collecting data from external sources that need rapid access etc. One day, you either get an out of memory error, or you notice that your program takes way too much time because you have less real memory than the virtual memory that your program needs. Solving these problems usually takes some major surgery to the program, and anyone who has discovered these problems just before delivering will learn to do some estimating early on in the design. The next thing you might discover is that the pattern by which the program addresses memory can change the speed of access. This is largely due to cache memory in the CPU, but could also be due to memory that hasn't been referenced in a while being paged out. Programmers who care about performance learn about how memory caches operate, but there are many different implementations with different characteristics. Unless you are lucky enough to be programming for just one implementation, your code should act reasonably well on all supported processors, which is not going to be easy given that they keep coming out with new processors. You probably need to make some benchmark programs to run tests on any processors you decide to support, and you probably need to keep up with what the chip manufacturers are planning. In the end, you learn that memory has lots of features. It may be shared between processes, it is not uniform in its performance, it may disappear because of access permissions and it may change value from one instruction to another because of another CPU or thread. These cases are fairly well covered in various processor manuals, device driver kits and text books. So even though we as an industry continue to see mistakes made because people don't understand these, at least they are discoverable by most programmers. This is all background to two stories from computing days before semiconductor memories took over the market. I started computing on machines that used core memory and even worked with a machine later that used drum memory as its main memory. It is worth pointing out that reading the memory actually sets the values to zero, so the memory subsystem has to re-write the value. Since it takes time to write the old value, specs at the time would cite how long it would take to read the value and how long it would take before the next operation could start. On one machine I worked on, the architect also figured out that some instructions could be sped up if the re-write was aborted and the memory system waited for a new value to write. This was great for instructions like "Add to Memory". The memory location would be read, the CPU would compute the result and then give the memory system the new value to write to the location that was just read/zeroed. A documented side-effect of this was to lock out any other memory operations during this read-alter-re-write cycle. So these instructions were also used for semaphore and thread locking operations. This caused problems later when semiconductor memory was used and multiple processors were more common. 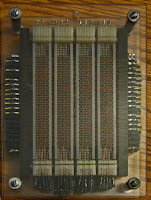 The first time I saw an actual core memory was in the basement of my father's business partner's house. He had been offered an opportunity to sell GE computers in the NYC area and he thought he should know something about them before he took the job. So he bought some surplus parts on Canal Street in Manhattan and put together a working CPU, core stack, and teletype interface. His conclusion was that computers were not as interesting as he thought so he didn't take the job. He gave me the memory pictured above. I think it is a register set, but I really don't know. The computer was available to everyone in the Dartmouth community. This was pretty radical for its time given the expense of computing, but it didn't cost that much more than a more restrictive policy and allowed for interesting non-traditional uses of the computer. The funny thing was every Monday morning when the first person signed on, the system would crash. Easy enough to recover from, but annoying and was unexplained. I believe it was John McGeachie who finally figured it out because I heard the story from him. So the machine was idle for days days executing the same instruction over and over. The net result was that those parts of memory that should not have changed value when that memory was read (remember reading clears memory) were changed. I'm not clear on the physics of why this happened, but it was observed. The solution was to change the idle loop to also sweep thru every address in memory just reading. This spread out the magnetic fields inside the memory. On the next machine the college got, they implemented the same idea but with the addition of an instruction that that you won't see on many machines: The Gray-to-Binary instruction. It was slower than a divide instruction and didn't reference memory. This was done to cut down on memory traffic in case the other CPU or IO channels needed the bandwidth. College hires are typically given jobs that are challenging, but if they fail, they won't bring the company down with them. My former business partner started a job a Data General where he was given the job of writing the file system repair program, while someone hired at the same time as him got the memory test program. You might think a memory test is simple. And a simple test is. But to do a good job, you should have a model of how the memory works and what kinds of errors it could have. A good memory test, when it detects an error, will give instructions on what to repair. There is tons of papers and practical knowledge for this area. Apparently, this new college hire was better than they thought. Or perhaps they were too busy to notice that he had completed what was needed and had moved on to more extensive tests. He noticed that when the core memory flipped (this was at the end of the core era), that it vibrated a little bit. He soon figured out that if you made them flip at the right frequency, you could set up a standing wave on the wires. And for a good percentage of the memories, if you did this long enough, it broke the wires. Management was impressed, but banned the program. This to me is another example of how even a boring task could be made interesting if you try hard enough. And how, if you hire good people, you may not get exactly what you want. Most of the time, little bits of code are straight-forward. But every machine I've worked on has little bits of code sequences that are very clever. Sometimes the code has instructions that are rarely seen and other times the instructions may be in odd ways. The older the architecture or the more complex the instruction set, the more chance you have of finding these little gems. This post is about the ABS function in the Intel x86 architecture. While this is not a lot of code, it has a jump instruction which on many processors can be expensive. Some recent processors can cut down on this expense if they can predict the jump, but it would be nice to find a solution with no jumps. It helps to remember that the expression "x>>31" does an arithmetic right shift of x by 31 bits and that "x ^ temp" means "x exclusive-or temp". The value of temp has either the value of 0 if x is positive or 0xFFFFFFFF (or -1) if x is negative. At this point, you may want to remember that in the 2-complement notation that -x = ~x+1. So, if x is positive, temp will be 0 and x^temp will just be x and the function returns x. If x is negative, temp will be -1, x^temp would be the same at ~x so the expression is the same as ~x - (-1) or ~x+1 which is the same as -x. The CDQ instruction extends the sign of EAX into EDX. 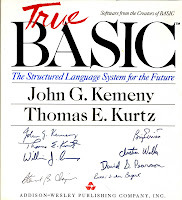 It is a 1 byte instruction that dates back to at least the 8086. If your numbers are in signed-magnitude or 1-complement form, then the sign bit just needs to be turned off. Floating point formats typically have an explicit sign bit, so the absolute function is easier on these formats. But these formats have other corner cases to worry about like two forms of zero which makes checking for equality a bit tricky. 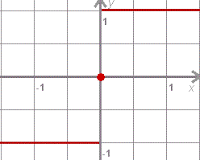 TEST   ECX,ECX ; (2) what sign does X have? This code also has the feature that there are no jumps, but it takes more code. And even though the CMOV instructions have been around for more than 10 years on Intel processors, there seems to be some question as to whether or not they improve performance. It would be interesting to know how this code was generated. It is worth noting that there is one negative value that the absolute function with return a negative value for. This value is the most negative value e.g. 0x80000000. This could cause problems if the code assumes that values that have gone thru the absolute function are in the positive number range. entitled "The Case for Working with Your Hands" made lots of interesting observations. The author, Matthew B. Crawford, noticed that not all jobs that require advanced formal education are either well paid or interesting and that not all jobs that require little formal education are boring or poorly paid. He described several white collar jobs that were truly awful. Sometimes it is the actual work that is awful and sometimes it is the product itself that is hard to stand behind. Crawford now owns a motorcycle repair shop specializing in older models and speaks of the joy of the job. He knows his customers, is presented with problems with no obvious right answer, apparently has no boss, and has to solve problems daily. He communicates with a community of other mechanics who have a lot of skills and experience. And it sounds like every day is interesting. Contrast his description of being in a traditional blue collar job with many software engineering jobs. Many programming jobs are pretty boring. Modern corporations are typically organized to isolate programmers from actual customers by having layers of program managers, sales people, customer support organizations etc. And for that matter, the customer support people are isolated from contributing to the code. It is easy under these conditions for important information to be lost and for individuals to become more and more specialized and isolated from the actual customer or problem. The author uses his jobs as a proof point that people should seriously consider blue collar jobs. But he is kind of mixing apples with oranges. I have certainly worked in software companies where the work was rewarding, management understood the quality of the work and what it was used for and programmers met with customers on a regular basis. And I've certainly worked in entry level blue collar jobs that I would never go back to. Bill Gates, in an interview sometime before 1992, said that his job as the company got bigger was to make its employees feel like they were working for a small company. He clearly understood that programmers do not work in a vacuum, but work better in small groups. Bill was very quotable, but many of his ideas were not translated down into the trenches. For example, in the mid-1990s, he said that Windows was designed to be Year 2000 compliant. Needless to say, there were many changes made after that to make this statement true, but it wasn't driven by his initiative. When Windows 2000 shipped, the leader of that effort, Brian Valentine, announced that any software engineer who wished to do so could visit a field office and/or visit some customers with a sales person present. If you wanted to take him up on the offer, you put your name and area of expertise into a database and the sales offices picked who they wanted. Some people went to India, Europe or New Zealand while others stayed in the USA. I was lucky enough to visit Nashville. The sales people kept us busy and we got to hear first hand what issues customers had with their plans for Microsoft software and Windows 2000 deployment specifically. This visitation program was never repeated. There were never any required trip reports, nor was there any effort to see what issues were commonly discussed. It was great for morale, but probably little else. Finding a career that you love and a company that you love to work at is hard. People often go to college because it is expected of them, and they major in what interests them at the moment. But young people often have broad interests and it is not altogether surprising that what interests them at the age of 18 is not the same as when they are 30. I once attended a talk by Ray Kroc given to an MBA class. Ray had started McDonalds hamburgers when he was in his 50s and was still quite active in his 80s when I saw him. One of the students, after hearing his talk, asked him what field he would go into to make money if he were graduating from a business school that spring. Ray responded simply: there is no guarantee that you will be rich, but if you do become rich, you will have to work hard. Therefore, he would recommend a job that, when you looked back on it in the future, you would feel good about your work. The problem, he said, was to find that job. This answer didn't make the student happy, but his thoughts have certainly stayed with me over the years. And now, as a parent, I find myself torn: I've always encouraged my daughters to figure out what they loved, so they could do that and feel good about it. But there are times when I wish I'd encouraged them in directions with well paying careers. I'll just have to trust that -- like the books says -- they'll be able to "Do what you love and the money will follow."